The Paiute is a very quick trigger mechanism. It is also fairly easy to set. Unlike the Figure-4 trigger, it uses cordage. Examine the photos carefully and you will get an idea of how this trigger works. The bait is placed on a long thin horizontal bait stick. This bait stick is held at both ends by friction. When the bait stick is moved, it slips off of the short trigger stick that the cordage is tied to (wrapped around the vertical stick). This allows the weight to fall. Be careful to place the deadfall so that it does not land on the vertical stick. It is advisable to place the vertical stick on a flat stone. 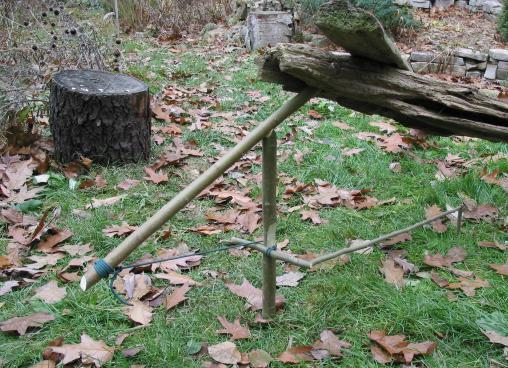 This will allow the vertical stick to fall out of the way as the weight falls (in the photo below, it will fall to the left). Trap and photo by Allan "Bow" Beauchamp Here is an overview shot of a paiute trap, showing overall positioning. Here's a clear photo of a Paiute deadfall trap. In this case the horizontal trigger stick is being held in place by a small short stick that has been stuck in the ground. Note the "V" point at the top of the vertical stick, fitting into the notch on the underside of the diagonal stick. 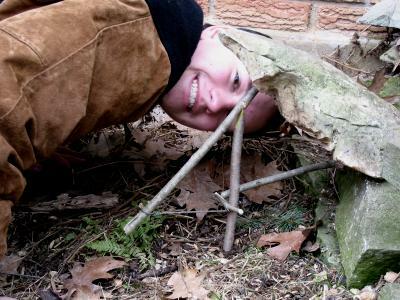 Trap constructed by Julie Liptak. Trap constructed by Alex Harwood. This type requires a knife to cut a notch on the diagonal stick and a point on the upright stick. However, the string has less tendency to slip upwards. Trap constructed by Walter Muma. 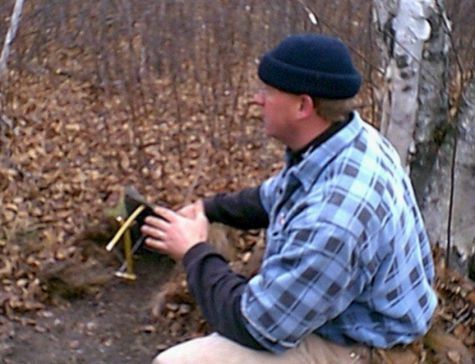 The Paiute deadfall trap is, in some respects, much easier to set than the Figure-4 deadfall. 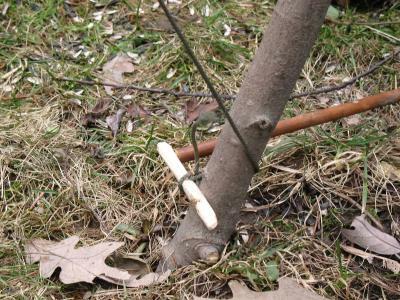 The one drawback of this type of trap, in comparison with the Figure-4 deadfall, is that it does require some cordage. However, the cordage doesn't have to be very strong. Therefore some elementary cordage could be whipped up from available plants without much trouble. 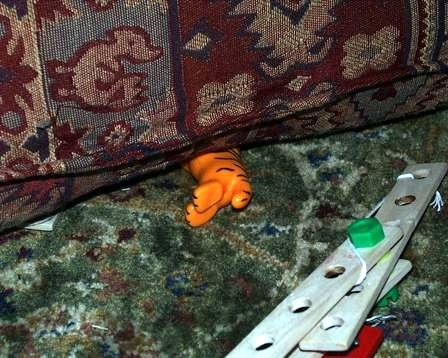 Note that this wouldn't necessarily be a very practical trap as it is set up here -- this is just for demonstration purposes. 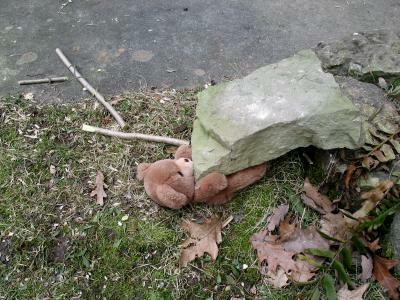 Here, the deadfall rock is too high off the ground to properly trap an animal. 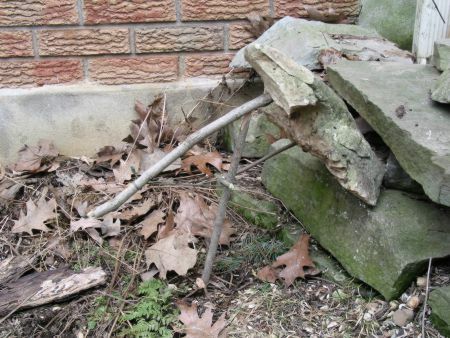 Usually the deadfall is positioned to that it will fall flat onto another hard surface. Closeup view of the Paiute trigger. 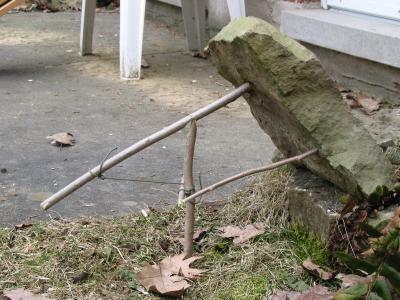 Here is a variation in which the diagonal is supported by a forked stick stuck vertically into the ground. In this case, you must be careful that this vertical stick does not prevent the deadfall from falling. 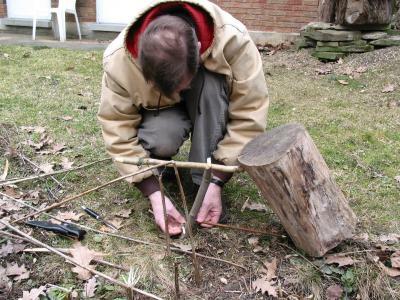 This form of the trap is unique in that it doesn't require a knife, although it still requires cordage of some sort. Note that the horizontal stick is held in a "V" at the top of the upright stick. 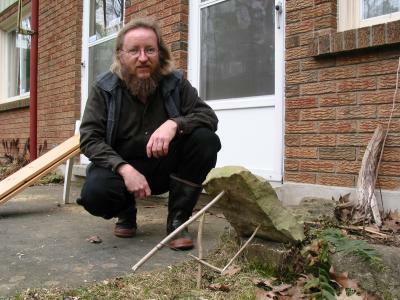 Trap constructed by Peter Linke. Please note that this short movie does not demonstrate the "proper" or "perfect" way to set this trap! 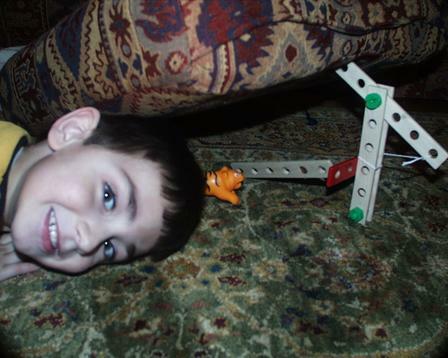 As you can see, it is entirely possible to build a Piaute deadfall trigger entirely from tinker toys.